It’s been far too long since I last hit sent on an email to this list, not since mid-July. Disconnect Me: Shakespearian actor Douglas Rain, the voice of HAL in the film 2001: A Space Odyssey, has died at the age of 90: nytimes.com. This year, 2018, marks the 50th anniversary of the movie’s release. Volume Off: The Free Music Archive is reportedly closing down: theverge.com. Robot Overload: A few days ago, the British electronic duo Autechre revealed it had uploaded 444 (yes, 444) new (yes, new) videos to YouTube, totally more than 13 (yes, you know the drill) hours of music. The result brings to mind a neural network’s combination of Hiroshi Sugimoto’s horizon-view ocean photography and Brian Eno’s colorful light installations. As is the case with many an internet Easter Egg hunt, the communal scrambling to make sense of the ambiguous material is reminiscent of the mysterious Russian video footage at the heart of William Gibson’s 2003 novel, Pattern Recognition. This was first published in the November 20, 2018, issue of the free weekly (well, kinda weekly, in a hopeful way) email newsletter This Week in Sound. Telegram Parenting: “Mommy-gram (and Daddy-gram) is an Alexa skill that essentially allows you to text back and forth with your child at home without he or she having a phone or even needing to know how to spell or read,” writes Emily Price at lifehacker.com. Mic Off: The human voice gets just one brief mention (“Chinese companies are developing globally competitive applications like image and voice recognition”) in this lengthy New York Times article on the Chinese surveillance state (“Inside China’s Dystopian Dreams: A.I., Shame and Lots of Cameras”), which certainly begs the question: What about the microphones? Hopeful for follow-up coverage. And, um, a future that looks less like that recent Clive Owen / Amanda Seyfried straight-to-Netflix movie, Anon. Sonic Sickness: The Center for Disease Control has joined the research investigation into the reported “sonic attacks” in Cuba and China, via Boing Boing. / / / Meanwhile, perhaps all this sonic-weapon anxiety has overlooked opportunities. Echo Location: You apparently don’t actually need an Amazon Echo to play that audio-only Westworld game mentioned here recently. Format Function: WYNC asks what a DJ is in the digital age. “We’re getting more music sent to us than ever in our history, and yet most of it’s digital and contains no other context so it gets ignored,” the article quotes Ken Freedman, the General Manager and Program Director at WFMU (via Mike Rhode). Face Dance: Latest reports, via fastcompany.com, that Facebook isn’t using “ambient audio” techniques to spy on its users — despite having a patent to, in essence, do just that, per the article. Duplex Planet: That Google Duplex AI mentioned here recently that can make phone calls for you might also find its way into call centers, per theinformation.com. We All Scream: Someone hacked the LinkNYC internet booths in New York City and made them play the music from ice cream trucks, per motherboard.vice.com, via Dan M.
Sports Doctor: My lack of knowledge regarding competitive sports can fill a stadium, so I’m always glad when someone like Gabrielle Cornish, a PhD candidate in Musicology at the Eastman School of Music, can do something like break down the sounds of soccer. Unquiet Place: “The premise: there is a mysterious and terrifying noise called The Sound that attracts children when they hear it.” That’s the story of a forthcoming film based on “first time filmmaker Julian Terry’s horror short They Hear It,” per Deadline. News Submissions: If you find sonic news of interest, please share it with me, and (except with the most widespread of news items) I’ll credit you should I mention it here. This was first published in the July 12, 2018, issue of the free weekly email newsletter This Week in Sound. To Serve and Project: The above photograph was posted during the Saturday, June 30, protests in Chicago. The photo is by local sound artist Jeff Kolar, who tweeted it that same day. 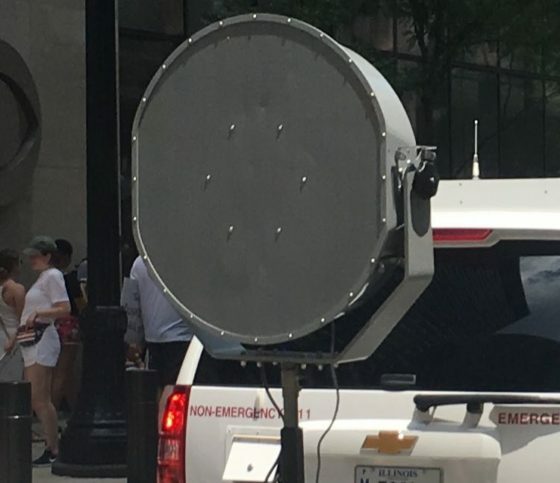 What is displayed appears to be a sonic weapon — a sonic dispersement tool — being utilized by the Chicago Police Department. People marched across the United States last weekend, in Chicago and other cities around the country. The marches were announced in advance. This wasn’t a mythical flashmob situation. The police, nonetheless, brought out their next-gen apparatuses — to what end remains unclear. Walking in protest hasn’t changed much over the years. You walk, you hold a sign, and there’s a chant — likely rhyming couplets, maybe iambic pentameter. Nonetheless, the technology of the police has been upgraded, and significantly — begging the question, to what end? Perhaps there is no explanation for police interest in the sonic weapon better than this: water cannons make for bad photo opportunities. The sonic weapon may be more effective, but it’s effective largely because its effects are invisible. Jetless Packs: Late last month I finished reading the recent novel Autonomous by Annalee Newitz, a cofounder of one of the first websites I read every morning, io9.com. The book is packed with crazy not-so-near-future science, like biohacking maker communes, programmable tattoos that move, personal submarines, and sentient robots with human brains in their bellies and nascent sexual-orientation issues on their indentured digital minds, just to name a few of Newitz’s projections. Nonetheless, maybe the most seemingly unlikely (for me) concept was in this sentence, which appeared toward the end of a chapter set in Casablanca: “At last a helicopter skimmed over the mosque toward them, its engines noise-cancelled to the point where all they could hear was the air being beaten with such regularity that it became a long, unending sigh.” / / / And then I read the news. The Yomiuri Shimbun reports, “In a bid to achieve the practical use of self-driving flying cars (see below) in the 2020s, the government will establish a public-private council possibly within this year to discuss safety issues, technological development and other matters. … As they will not produce engine noise, noise pollution will also be reduced when they fly over densely populated areas.” / / / Meanwhile, NASA is testing “quiet supersonic” aircraft: engadget.com. Audio Briefs: Additional news. Type Cast: “Some computer scientists turn to voice-command tools to avoid the pain of typing,” writes Anna Nowogrodzki: nature.com / / / Tape Heads: There will (finally!) be toys based on the Transformers that hide among us mere humans as mere tape cassettes, rather than as muscle cars: io9.gizmodo.com. / / / Habla Overkill: The EFF helped fight back a patent that “essentially covers a language lesson on tape”: eff.org. / / / Tome Raider: The rise in audiobook purchases means Amazon, which owns Audible, may have something of a lock on an entire medium: newrepublic.com. This was first published in the July 5, 2018, issue of the free weekly email newsletter This Week in Sound. Disrupting Abuse: “Abusers — using apps on their smartphones, which are connected to the internet-enabled devices — would remotely control everyday objects in the home, sometimes to watch and listen, other times to scare or show power. Even after a partner had left the home, the devices often stayed and continued to be used to intimidate and confuse,” writes Nellie Bowles in a widely circulated New York Times article. Bowles details how “Internet of Things” gadgets have become the tools of domestic abuse. It feels like we’re well past the idea of “unintended consequences,” an overused term that has an undeservedly forgiving geewillikers quality to it (“Just some good ol’ software engineers, never meaning no harm …”). We’re deep in the territory of what you might call “blind-eye consequences,” the consequences when technologists don’t do sufficient due diligence on the impact, the mis-use, the unintended use, of their inventions. AI Yay Yay: There is, of course, the underlying anxiety about the role of always-listening devices such as Alexa in our lives — a future-shock phenomemon ripe for a novel by the late Michael Crichton, who originated both the rebooted series mentioned above, Jurassic Park and Westworld. Last month, Amazon explained how a private conversation was accidentally sent to one of an Alexa user’s contacts: “As unlikely as this string of events is, we are evaluating options to make this case even less likely,” quoted by Richard Gao at androidpolice.com. Audio Life: 1. Turns out there was nothing wrong with my Bluetooth headphones that a cable couldn’t fix. / / / 2. This is a new hassle for me: finding my place in an audiobook I fell asleep listening to. My TV guesses pretty well when I nod off. My phone apparently doesn’t. This was first published in the June 28, 2018, issue of the free weekly email newsletter This Week in Sound. Fight Club: The second season ended a few weeks ago, but if you’re not watching The Good Fight, CBS’s sequel to The Good Wife, it’s highly recommended. Every episode of this legal drama is packed with wit, ingenuity (often of the meta variety), and remarkable performances. The show also has carried on The Good Wife‘s attention to sonic detail, from the soundmarks of social media to the aural choreography of urban life. The season’s penultimate episode, “Day 485” (each week jumps ahead by seven days from the previous, and takes its episode title from the number of days into the current U.S. presidential administration), ends with a character walking free of a potentially life-changing legal hassle. He is heard whistling as he walks down the street. What he is whistling is the show’s theme song. Sounds of Science: Short bits from the annals of science. / / / The Vision: The role of vision in shaping “audio spatial metric representation around the body” — in other words, how sight helps us hear better: nature.com. / / / Brain Meld: How “interpersonal neural synchronization” (INS) allows an individual to hear another individual across a packed, noisy room: nature.com. (INS refers to how “brain activities from two persons covary along the time course.”) / / / Fashion Sense: In ever-so-vaguely related news, male peacocks can emit a sound with their celebrated plumage that makes the crest of a female “vibrate energetically”: newscientist.com. / / / The Conversation: And this goes back a couple months, but related Google research involving ability for AI to detect a specific voice in a crowd: androidpolice.com / / / The Meg: On the development of a Super-Oscillatory Acoustic Lens (SOAL) that “operates in the megasonic range”: nature.com. / / / Blipverts: If the simultaneous appearance of the terms “stealth placement marketing” and “limbic lobe” in the same article intrigues (i.e., frightens) you, then read this research, which “used the representation or sound of brand placement as independent variables to test the effects of brand placement on the viewers’ discrimination and preferences, with reference to brain activity indicators”: nature.com. This was first published in the June 21, 2018, issue of the free weekly email newsletter This Week in Sound.